...and other promotional scams on the circuit. At Pear Shaped people often ask me "How can the gig possibly be any worse"? The answer's simple - you create a gig where BOTH the audience and the punters pay! So.. what’s SO wrong with Pay to Play? Firstly let’s look at how comedy promoting has worked historically and indeed most would assume it does work. For those of you who are new to the world of comedy promoting here’s a picture I happened upon from the Ladybird Book of Comedy Promoting 1981. Of course being a Ladybird book the promoter is always a man - the woman is at home ironing - but you get the idea.. Isn't that a bit simplistic? Clearly the Comedian's Job is to Write and Perform Material while the promoter's job is to sell the performance. 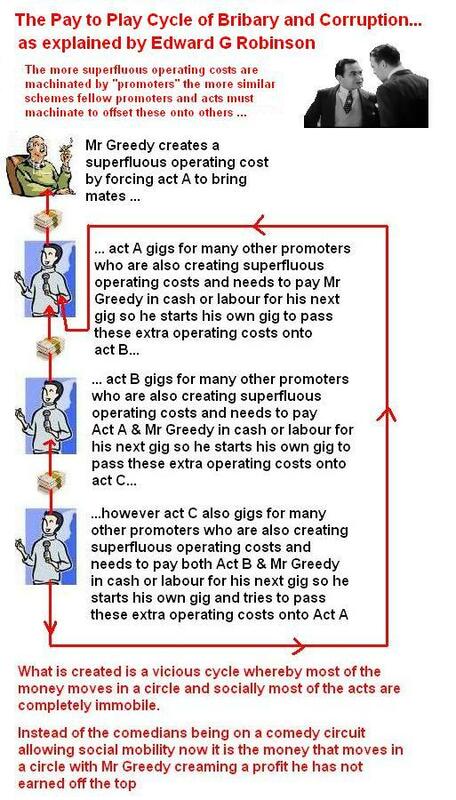 Promoters don't write material for the acts or perform it so why should the acts perform the functions of the promoter? Sometimes the promoter may be an act or may be a businessman but clearly it's the promoter's responsibility to get a crowd not the acts. Surely no one's actually stupid enough to Pay-to-Play anyway? "Well, if these idiots are prepared to pay me for stage time why not?" However, it was only a matter of time before some people tried to shortcut the system by using open spots as the UNPAID source of flyerers… Much duplicated, this scam was first invented by a promoter (Ms Lazy) who would book exclusively new acts and when they got there, send them ALL out to flyer UNPAID! It's actually again a very simple con. Instead of asking one person to do 7 hours of unpaid work you ask 7 people to do 1 hour of unpaid work. As a result you get a whole day of labour for free. Eventually when you run out of people you can talk into this, you don't tell anyone up front what you're doing until they get there and if they don't do it you refuse to put them on. They're then forced to work for you or have had a completely wasted journey. This scam is usually perpetrated by telling people "We're all working together!" ...although the promoter keeps all the money and glory for themselves of which there is usually very little. but without the obligation on the act to physically purchase the tickets up front. The open spots are actually being used to form a call center but they dont think this is unsual while they are making the calls because they are physically separated and as they are all new acts they are unaware this isn't promotion it's simply recursion! Another way of perpetrating the scam is not to tell anyone explicitly you expect them to bring someone until you email them to confirm days before the gig making sure they have no time to find another gig for that night so they are blackmailed into either complying or ending up with a hole in their diary. "There are 15 odd acts each week delighted to bring a couple of friends". Dunbar's number is a theoretical cognitive limit to the number of people with whom one can maintain stable social relationships. These are relationships in which an individual knows who each person is, and how each person relates to every other person. Dunbar used the correlation observed for non-human primates to predict a social group size for humans. Using a regression equation on data for 38 primate genera Dunbar predicted a human "mean group size" of 148 (casually rounded to 150). If a new act gigs twice a week on average and has to take a new 2 friends to each gig this means that after 75 gigs he will have totally exhausted all his relationships in only 9 months. He will then have to create new social relationships at the rate of 2 a week. Since he can only keep a maximum of 150 friends going at any one time this will mean he will have to lose 2 of his old friends a week so that every meaningful relationship he had before will have been ended in just over a year and a half. And that's assuming no other acts are his friends.....Clearly this is unsustainable nonsense. Perhaps there are people who can run their Facebook log in like that but no one can sustain real social relationships like that, can they? If they can it's a miracle of social harmony. So what happens in social reality is that open spots end up dragging other open spots to bringer shows (as all their newly formed relationships are with other opens) and pretending that they're not acts but required audience members. The promoter then pockets the £13. The acts have also paid to travel to the gig. This is silly, as if they'd pooled their resources they could have stuck it all into petrol money and gone and done an out of town gig, where they would be rebooked if they did well. Out of town promoters are more than happy to give open spots petrol money in order to fill their stage time. It is only London promoters who have socially isolated themselves by banning anyone who disagrees with them who think we really are all that stupid! 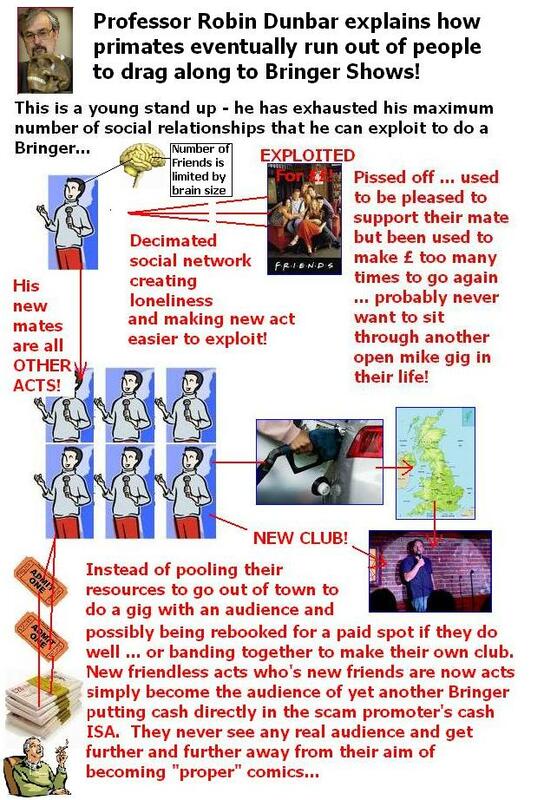 While it's true that friends of new acts will always be part of the revenue of an open mike night, forcing people to bring mates or coercing them is trying to lean on them to do the work of the promoter for themselves. Most of the time I have found that a percentage of new acts bring mates anyway so why force them to do so? There is only one reason - to increase turnover for the promoter's cash ISA. Whether the public or acts enjoy themselves is of no consequence. Its a very small price to pay when you think about the benefits to you. The important words here are price to pay. It is an open admission that acts are paying for stage time. The key phrase here is both parts - it is an admission that the promoter has to keep the new acts and established acts separated, in order to institute his policy of effectively charging the new acts. If you agree to do a Bringer show, book it and bring no one and let the promoter stew in his own impotence. No matter how many IMPORTANT famous people the promoter photographs himself with or boasts about knowing if he really was powerful he wouldn't need YOU to bring an audience. Respectable clubs don't lean on new acts to bring in punters. No one has the right to ask you to do unpaid manual labour. It is just a few comics who are annoyed by it. When HUGE numbers of acts professional and new annoyed by this ! I am not running a vendetta but you can check this out by searching the Chortle News archive and forums. Without a venue there can be no gig. While in New York real estate prices are astronomic meaning club owners there can bully acts in this way decimating their own industry, there are over 55,000 pubs alone just in London many of which have function rooms and that doesn't even include arts centers and proper entertainment venues. Just how stupid do you think we are, Mr Bigness? No, we didn't. We really really didn't. But my scam is a new way of doing things...? I am sending a coded message to the acts that I expect them to pay to play while attempting to conceal the fact they are being charged to perform from the paying public. Actually, this is a black lie - I dont really need to charge at all I'm just very ruthless and very greedy. The combination of our website, our huge mailing list, and our facebook site means that your name gets seen by approx 13.000 people in any one week . That includes media folk watching out for the stars of the future. Anyone can set up a website, mailing list and facebook site - Mr Bigness didn't invent the internet. Exploitative practices are often defended with the phrase "media folk watching out for the stars of the future". Promoters and agents go to gigs anyway. Yes, Avalon actually do send people out to open mike nights to spot and trawl for new talent - good on them! I know this because I've sold them tickets. The venue makes a bit on drinks which I need to happen in order to stay there. Some new act nights have been running for over a decade if no one does come …erm … what’s the point? Actually many people have asked us that but we're still there. Seriously though despite some very slack periods indeed in the past we've never lost the room and ...if no one ever does come ... You need to think about why your gig doesn’t work? Besides which being thrown out of a venue isn't the end of the world. If todays established promoters had let little things like being thrown out by the landlord stand in their way... The object of promotion is to run an event people want to come back to not to fill pub rooms by bullying. If you have a respected name people will come back even if you move venue. It helps towards my costs of putting on the night. I should point out that I spend many hours during the week pushing the event. It was until you ran a scam and damaged your reputation for integrity within the "industry". This has worked as a really good formula for the past two and a half years...? No, it has not. Your name is mud all the way from Portsmouth to Manchester. This is why you are still doing open mike nights after ages and ages on the circuit. People pay to do the Fringe - this is no different? ... everyone was much happier! These people are doing it for a hobby, so why shouldn't they pay for it? Many people do comedy for a hobby, semi-professionally or professionally. However, even hobbyists and part timers do gigs in order to get gigs. An open spot is meant to be a job interview for a paid spot. Or a chance to test new material in a situation of less pressure as the gig is unpaid. The comic is actually doing the promoter a favour by turning up and filling stage time - not the other way round. 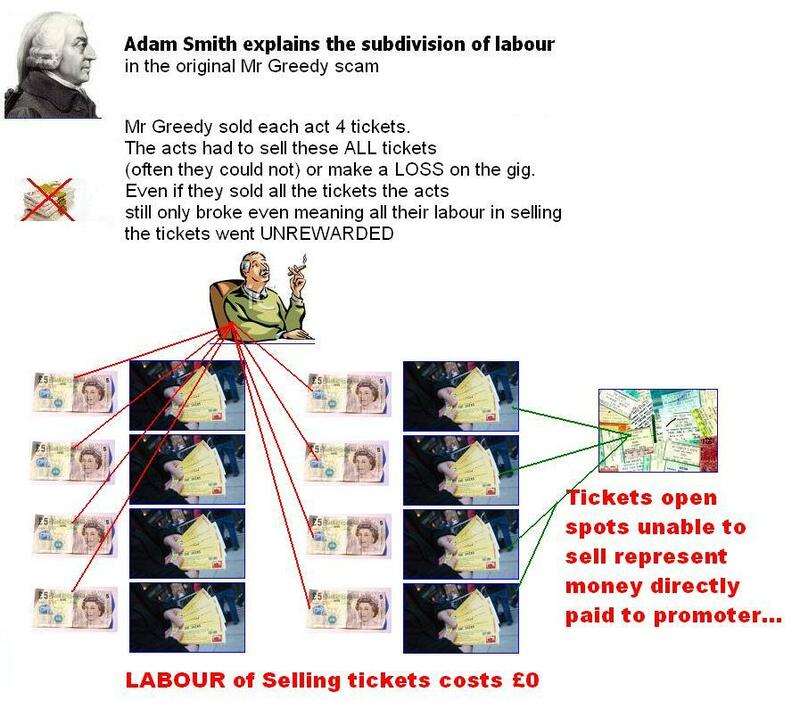 If someone is doing a gig-they-paid-to-do to get an unpaid gig then firstly they are bribing the promoter which is unethical and secondly the promoter is trying to get them to work for less than nothing or do the labour of promoting for them in order to turn a profit. 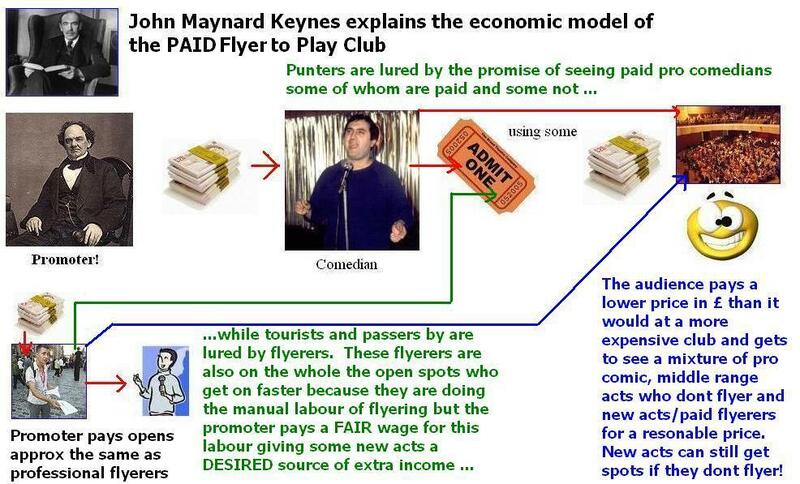 And if the public are paying to see the acts and the acts are paying to be seen this is a Pay-to-Play scam. Also, if an open spot is a job interview then pay-to-play gigs are by definition employment scams and employment scams are actually a form of advance fee fraud. So long as you are prepared to pay someone upfront to find you work they have no incentive to actually find you any or create more employment. So it's always ultimately futile to pay someone for a gig. Unlike general cons or sharp business practices that prey on people with disposable income employment scams are particularly obnoxious because they prey on the most vulnerable people in society - job seekers. If I want to pay to play why is that wrong? 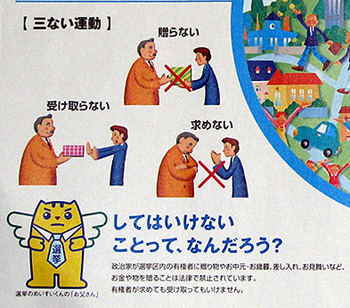 It is bribery. An open spot is meant to be a form of job interview. If you have to repeatedly pay for job interviews that is a type of employment scam and there is legislation against such scams even if the various pay-to-play gigs fall between the cracks. No professional comedian will knowingly perform at a Pay-to-Play gig. There will therefore be no progression. Even if a proper comedian is willing to play a Pay-to-Play night the promoter will not want them in their room for fear they will be disgusted at how the other acts are treated. Being a comedian isn't just about being funny. It is also a sales job. The job of the comedian is to be funny and to sell the fact he/she is funny to promoters. Salesmen who sell complex manpower projects to large organisations have long used symoblic logic to try to map who has influence and authority within an organisation in order to maximise their chance of a sale. Whether an organisation/promoter has 1,7 or 1000 individuals working for them, all organisations have one thing in common - the number of people with the infuence and authority to spend money is usually limited to one or two at the most. These people are often hard to reach so the salesman tries to impress people of moderate influence and authority in order to find someone who has sufficient social influence with the actually powerful to get him work, contracts (or in our case a gig). As the animation shows, people who pay-to-play instead of working for free or for nothing actually have negative authority and negative influence. Basically they are giving money to someone who's ambition it is to keep them at the bottom of the comedy ladder for as long as possible. 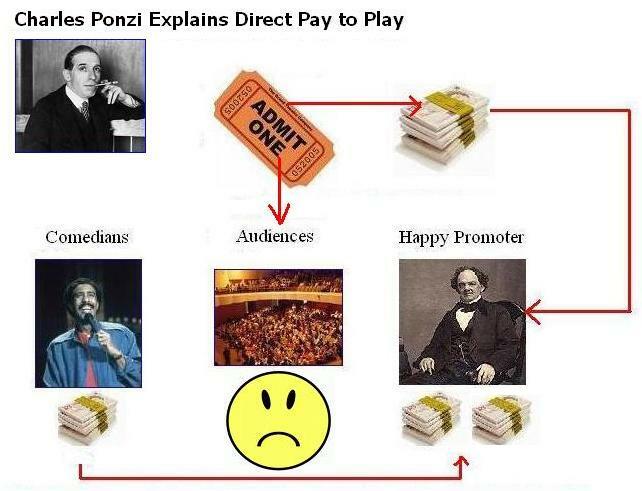 The more promoting work they do for for free the more power the scam promoter gets. It's not an unregulated free market and you can't behave as though employment law didn't exist or abuse the goodwill of acts and the general public forever. As explained above, as well as being employment scams, pay to play scams are also simple forms of old fahsioned bribery and corruption. For all their talk of "free markets" pay-to-play promoters are actually simply engaged in old fashioned anti-competative practices that create a very unfavourable business environment by encouraging unfair advantage. But these are just amateurs? All professional acts started out as open spots at some time and promoters who value the labour of open spots enough to put them on for free are not happy about "promoters" trying to undercut them by using opens as a source of free money/labour particularly so when they are acts themselves expecting to be given free stage time at other clubs. Furthermore it is our experience that when they run out of sub-minimum wage labour some of these "promoters" come round free-to-play clubs trying to find more people to force to pay to play against their will and when they are confronted and ask to leave turn very nasty. 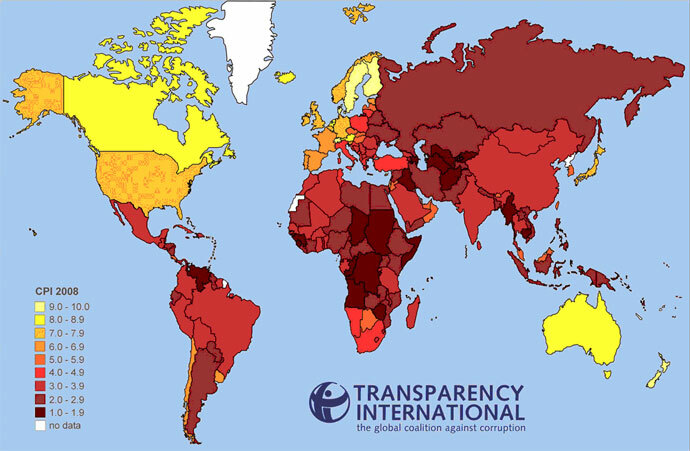 ....this is the usual effect of bribery and corruption increasing the cost of doing business (see above). Then the new generation of comedians will the be decided by how much wealth they have rather than how funny they are and poorer people will be excluded from the comedy circuit meaning the development of talent will suffer. People who support paying for stage time are really dividing society and decimating the industry as famously happened to the New York comedy scene. Everyone does unpaid gigs somewhere and everyone needs a promoter to take a risk on them at the start of their career. Running open mike gigs is relatively inexpensive whereas comics have large overheads - travel, festival shows etc ...we travel all over the country and the world ... making people pay extra on top of that will exclude more and more people from trying. Orange Shaped and the Laughing Goose and Playfulness Comedy Clubs and New Acts at the Zebra and many other promoters have been selling New Acts to the public for over a decade. New acts are more than willing to gig for nothing. If you cant make money out of people prepared to work for free then you're just really really really bad at business. If you put on an open night sometimes you get Daniel Kitson and sometimes you get a mentally disturbed young neo-nazi woman talking for five punchline free minutes about gas chambers while killing the evening stone dead but most of the time you just find someone who’s okay. Also a lot of new acts are uncommitted and just dont show! which makes the waiting lists for a spot for those genuinely interested even longer. The upside of booking new acts is that you get their contact details before anyone else and can circumvent agents and middle men. I didn’t tell you that though. which is a legal requirement which one can be fined £2,500 for being without. This is a black lie designed to deter open spots from starting their own clubs and promoting for themselves. If this was true half the open mike promoters in London would be breaking the law. After a long consultation with the CAB about HSE and 14 years in promoting we have decided this is simply NOT true. Doorsplit gigs where the acts share all the profits are explicitly exempted as there is no "profit" ...meaning that there is no money held back by the employer to be re-invested or diverted to a cash ISA. if you do not need employers’ liability insurance for people such as cleaners or gardeners if they work for more than one person how can it make sense that you possibly need it to put on a 10 spot....? Obviously if you regularly run lots of gigs and have people who work exclusively for you you might need it. If you are a familly business who only employs relatives and not incorporated as a PLC then you definately dont need it. The regular misquotation of these regulations is just sophisticated middle class intimidation intended to make promotion seem hard when it is not. Of course if you're really worried you could come to an agreement with the venue for them to cover you under their ELI but since we havent managed to find any examples of single small club being fined since the legislation was enacted in 1969 that would seem to us to be a tad over-cautious. it's FREE entry so I'm not charging them to perform? Then the cost of the average open mike gig of 10-14 acts (including comperes) to put on in travel expeses is £50 to £70. duplicates this travel cost at least once over generating an extra £35 in travel costs. duplicates this travel cost at least twiceover generating an extra £50 in travel costs. 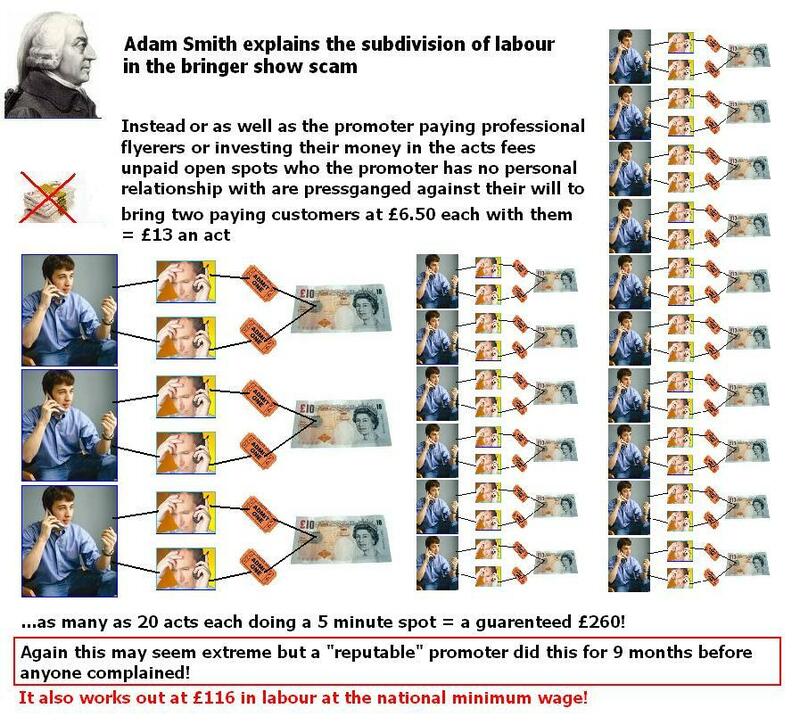 A ONE PERSON bringer = a free £125 in labour assuming their travel is under an hour. A TWO PEOPLE bringer = a free £250 in labour assuming their travel is under an hour. If we further factor in the drinks they wouldn't have bought which are "funding" the night. These statistics still assume that only half the people required by the acts are actually brought or are unwilling to be there. From which we have concluded that although he hasn't cloaked his disreputability .... London's only direct pay to play promoter is probably cheaper (in time and labour) to "work for" than London's "reputability cloaked" bringer promoters if you multiply out the equivalent NMW and travel costs. So it is not hard to postulate that bringers steal more of an act's resources than direct charges. It is little wonder then that these bringer bookers are getting healthy bungs off of landlords for putting on these shows which, of course, may also undermine the negotatiating position of non-bringer gigs with their venues. Why let someone have a venue for free when you can make them pay through the nose by subcontracting to an outside "promoter" the implementation of extremely top heavy, hierarchical business structures designed to make people work for less than the NMW just to do a job interview? that cloak their exploitation as somehow "democratic". The fact that this process kills new talent must always be someone else's problem. Why dont you name and shame individuals? ..., it's just a fact of life that the Entertainment Industry has always suffered from this sort of thing. Also many of these practices are/have been copied/imported from other areas of the "performing arts" where ambitious cheap labour is even more plentiful than in stand up. If you think the London open mike circuit has a problem with exploitation then you should read this site ... by former (now retired) Equity frontman Clive Hurst about his campaign against exploitative modeling and acting agencies and the attempts by himself and Equity to close the many loopholes in National Minimum Wage law and the many personal attacks on his person and property that resulted. The Entertainment industry has more NMW breaches than any other sector of the ecconomy. As from 1 January 2011, employers who break the law on basic pay will find their names published on the Department for Business website and given three months in which to correct the breach. Edward Davey, the new Employment Relations Minister, said: "Bad publicity can be a powerful weapon in the fight against employers who try to cheat their workers and their competitors. Their reputation can be badly damaged if they are seen to be flouting the law". Wonderful work! Every open spot in London should buy you a pint! It's only a rival promoter and a few new acts who object to it. You can read miles of objections by acts and promoters at all levels of the circuit on the Chortle Forums. People who run bringers, unpaid-flyer and pay-to-play gigs make a big song and dance about their important friends in the business in order to intimidate the young, new and vulnerable into bowing down before them. But remember while all acts should respect the booker you are not his slave. He/she is only one booker. Most comedians are happy with the existing system to gig for nothing or relatively nothing if they're free and want the stage time. 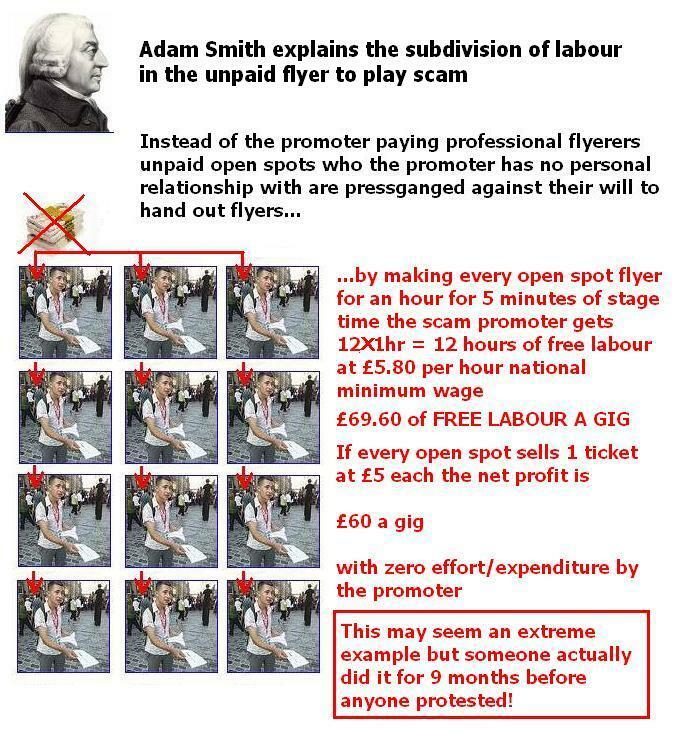 So if you know of a promoter using opens as free labour do something about it! And dont buy tickets directly from opens. Go support new acts but make sure they're not being leaned on to sell you tickets.